It may seem counterintuitive, but some of our greatest thoughts might just come to us while we’re in the bathroom. Whether it’s chalking up a to-do list in the shower or gaining some insight from a bathroom read, there’s something to be said for a little time alone to just think. 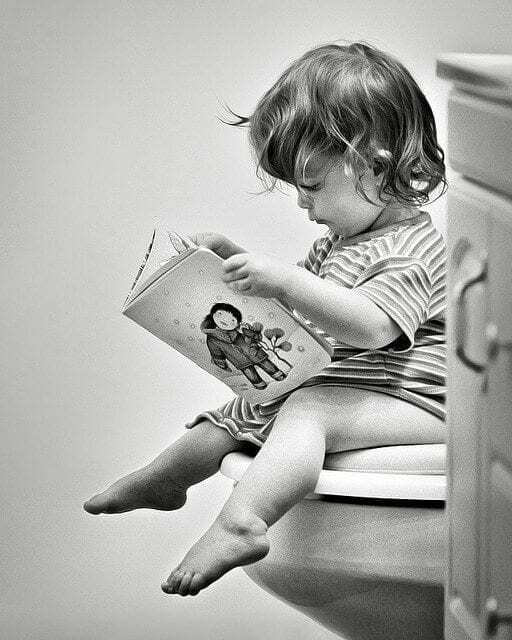 If you’re going to be spending some time in the bathroom, you might as well be learning a thing or two about the world or about yourself. Take a dive into some of the best books to stack in your boudoir. Chock-full of quotes from history’s brightest minds, from Buddha to Fred Astaire, you’ll find just the inspiration or giggle you’re looking for when it comes to aging with grace, or at least with a sense of humor. With this read conveniently in your bathroom, you might just leave the room a better person. Featuring some of the best works dug out of fifteen years of O archives, you’ll find lessons on asking for what you want, Neil DeGrasse Tyson’s universal wisdom, and other enriching stories told by some of the greatest writers to date. Don’t worry, no one will judge you for staying in the bathroom just a little bit longer. Not only testing her theories on herself, but on family and friends, Rubin breaks down habit formation and why it can lead to a happier, more productive life for all of us. 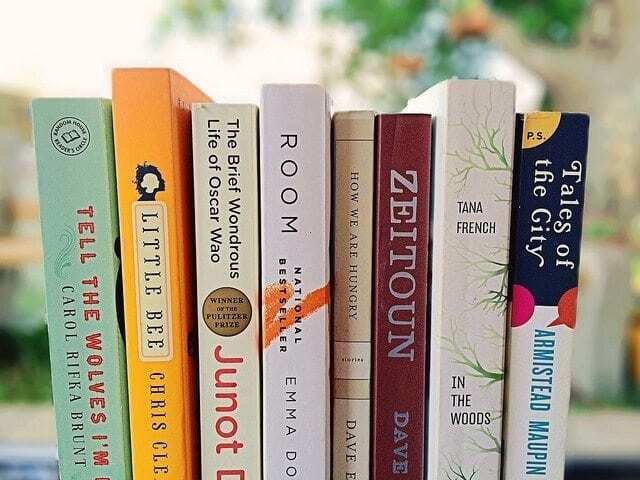 From discovering which habits you should keep and which you should ditch, to why it’s just so hard to make them, you’ll be better for reading this. At least you’ll feel better knowing you’ve mastered one habit: bathroom breaks. As self-explanatory as need be in its title, this humorous take on something we all do sets a great tone for any bathroom guest. From young to old, anyone flipping through these pages will have to get a grin on their face. You’re going to have to bear with me here for a minute. 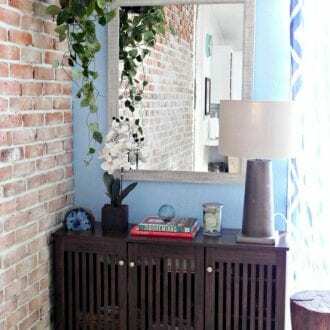 As you are probably well aware of by now, mirrors are kind of a passion of ours around here. So when we come across something like this it kind of blows our mind. 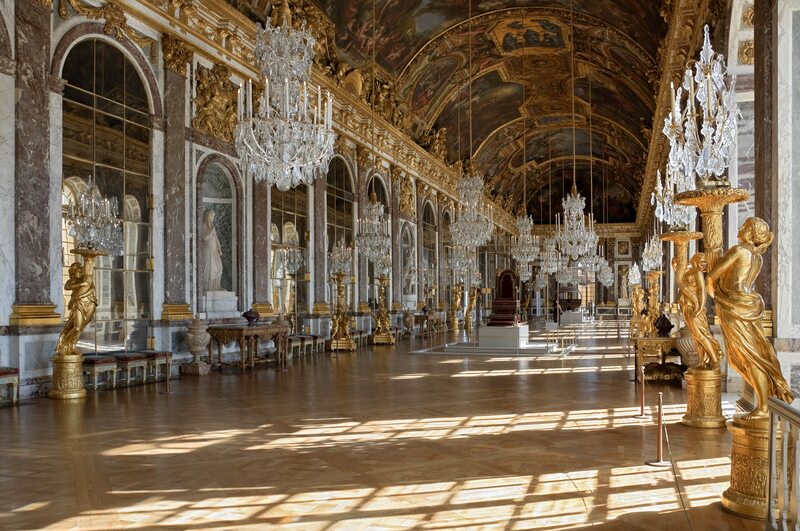 Now I’d heard of the Palace of Versailles before but I had no idea that it had a room like this! The Hall of Mirrors?! You had me at the name alone! As the name implies, the Hall of Mirrors (or Galerie des Glaces if you’re feeling fancy) houses seventeen mirrored arches that reflect the view over the palace gardens. 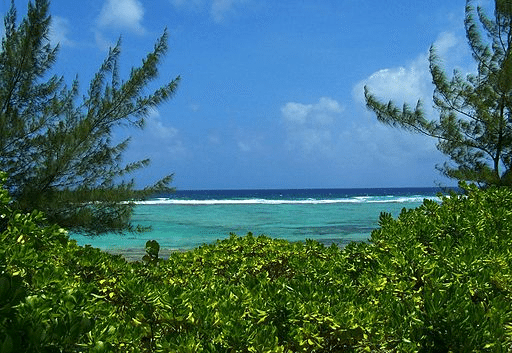 Not a bad idea at all when your backyard looks like this! “Orangerie” by Urban at fr.wikipedia – Licensed under CC BY-SA 3.0. “Versailles chateau” by Marc Vassal – Licensed under CC BY-SA 3.0. Now you may not be able to recreate something exactly like this in your own space, but there are some mirror frame styles right here at Frame My Mirror that evoke that larger-than-life, palatial French style. If you’re in the market for a little regal flair check out the Hudson in Nickel or Val Verde in American Pewter. Before you know it you’ll be shouting “let them eat cake” to the masses! Because of our business, we like to consider ourselves experts when it comes to bathroom design. That being said, we still like to acknowledge those that came before us. 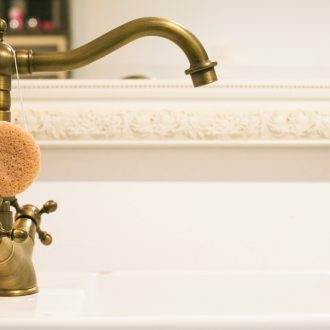 Those who pioneered bathroom design and functionality (shout out to the inventor of toilet paper), and that’s exactly what we’re doing here with a little trip into the bathrooms of history. For this installment, we’re featuring the bathroom of one of history’s larger than life characters. The one and only King Henry VIII. While you might not have guessed by looking at him, Henry VIII was quite the innovator when it came to hygiene in Tudor, England. 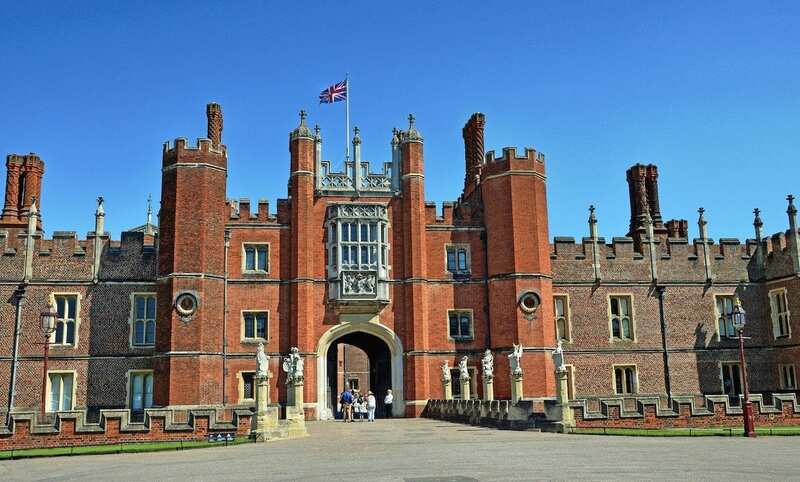 When the monarch elected to make Hampton Court Palace (pictured above) his primary residence he demanded – in true kingly fashion – that a new “royal throne” be built within his stately tower. The room consisted of a beautifully constructed window seat, a gold-patterned ceiling and an imposing copper tub…high style even by today’s standards. 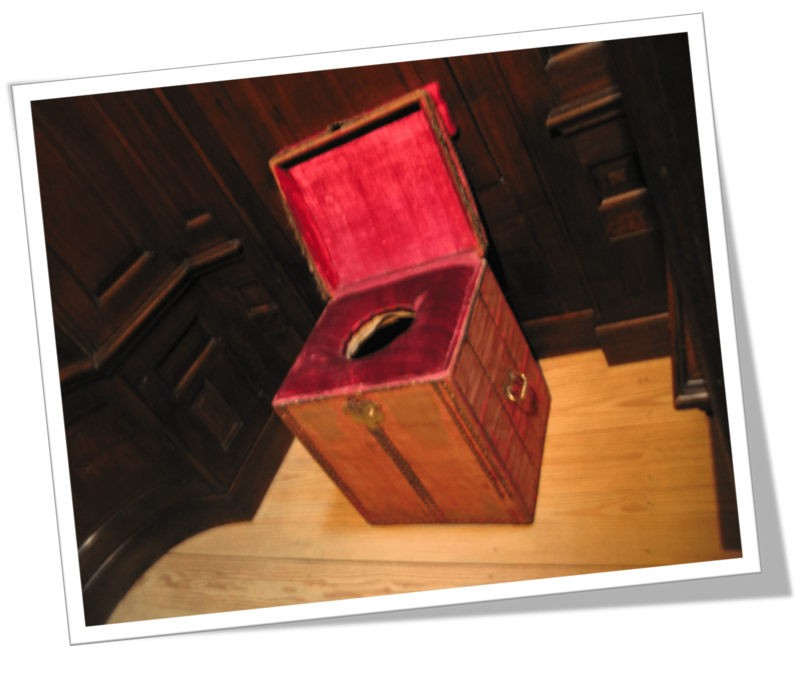 Perhaps even more famous than the bathroom itself was the king’s personal toilet within his Privy Chamber. While certainly an interesting feature as it stands, it’s what the king kept with his toilet that makes the story so interesting. The room was served by a personal attendant known as the Groom of the Stool. That’s right. And owing to the “close and personal” nature of the job, the position was highly coveted by courtiers of the period. So there you have it. From us, the people that make bathroom design their business, we proudly honor Henry VIII and the room he fashioned to do his business. A lot of soul searching happens in the bathroom. Think about it. How much time do you spend weekly in yours? Between showering and taking care of any other business, time spent can really start to add up! One of my favorite things to read are motivational and inspirational works, and like most people, the bathroom is the only place where I can find time to enjoy them. I recently was sent an article on just appreciating life, no matter your situation. 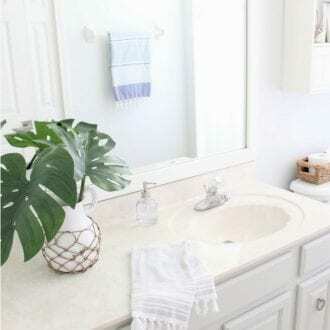 It was from the authors of 1000 Little Things Happy Successful People Do Differently, this particular article spoke to me, so I had to feature it on our blog for our new category, Bathroom Reading. I hope you enjoy! 8 Things To Remember When Everything Is Going Wrong. Pain is a part of growing. Your scars are symbols of your strengths. Other people’s negativity is not your problem. What’s meant to be will eventually, be. The best thing you can do is keep going. Read the full post at Life Buzz!